Our vision is to make New Zealand a better place. For our children and our children's children. To strive for equality and fairness, working in partnership with friends and allies who share our values. Creating our own success, with skill and passion. Celebrating difference, nourishing opportunities for action, And being leaders in everything we do. Te Puna Hauora kaupapa, tikanga and kawa are embodied in the traditional concept of whanaungatanga. We pay tribute to Pa Henare Tate, who is the author and teacher of this inspirational concept. Whanaungatanga encapsulates the tikanga of tapu, mana, and their expression through the principles of tika, pono and aroha. Tapu can be broken down into three perspectives. ‘tetapuitewhenua’ (the tapu/sacredness of earth). The underlying principle here is that all living things (birds, rocks, tress etc) have an intrinsic sacredness. Secondly, there is the tapu/sacredness of relationships between atua, tangata and whenua. Therefore the intrinsic sacredness of both a person and the earth must be acknowledged and respected in any relationship between them. Many believe that the relationship between people and earth is validated through the relationship between people and god/s. A person breaching the relationship with the earth via abuse i.e. burying toxic waste, is in effect also breaching their relationship with atua as well as whenua. Thirdly there are tapu or sacredness as relating to tapu/restrictions. These restrictions support and enforce the intrinsic tapu and relationship tapu. An example of this kind of tapu would be ‘rahui’. Rahui is a limit or ban on use of a particular resource which is put in place either to protect the resource or people. Mana-whakahaere is the spiritual power and authority of people to order and determine their own lives according to tika, pono and aroha. Mana-tuku is the spiritual power and authority of those with tapu and mana to share of themselves and their resources with others. Aroha is the principle under-pinning mana-tuku. Manaaki is the act of sharing. Mana is also authority, prestige, honour bestowed by atua of people upon individuals or representatives. Tika can be defined as the principle concerned with the right ordering of relationships, among atua, tangata and whenua, the right response to those relationships and the right exercise of mana. In other words the right way to do things. Pono is the principle that seeks to reveal reality and to achieve integrity of relationships. In other words it calls for honesty and integrity in all that we do. Aroha is the principle of expressing empathy, compassion and joy for others in all that we do. Tika, Pono and Aroha are the principles of action by which we exercise tapuand mana. If one wants to have mana, one must first seek after tapu. To possess tapu one must exercise tika, pono, aroha. These whakatauki underpin the kaupapa Maori component of our model. The attitude of practice must reflect the spirit contained in this whakatauki, entwined throughout delivery at every level. The restoration of Mana of people cannot take place unless the other three parts of the corner stone of Maori health are underpinned by the fourth, which is Taha Wairua (spiritual component) drawn from the Whare Tapa Wha model as articulated by Professor Mason Durie. 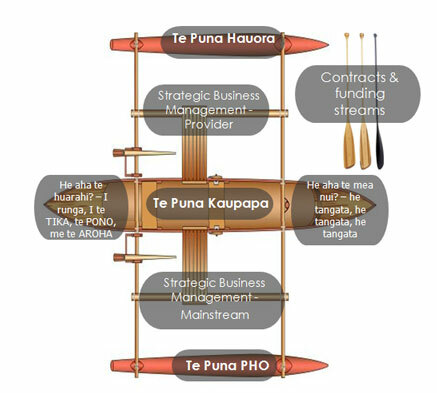 Our Kaupapa Maori model of delivery is encapsulated in our Harakeke-IMAP model. This model when practiced within it’s true spirit, both generic and kaupapa Maori, is the korowai which encompasses the individual, whanau, hapu and iwi. It focuses and brings alive the whakatauki which we have heard mai rano. It is the heartbeat of Maori development when practiced in partnership with different groups biculturally, multiculturally, intersectorally, intra-sectorally, intra-physically. Established by its marae to progress the spiritual, cultural, social and economic growth of Te Rarawa. We work to develop opportunities and initiatives for the future of our people and the protection of our lands and other taonga. In July 2013 TROTR signed a Contract for Software and Support Services with TWONA. TROTR is currently using TWONA IMAP Online for their community support services. A leading Health Care provider delivering a quality service contributing to the mana motuhake of whanau, hapu, iwi and other peoples. Situated in the leeward breezes of Taitapu Bay on the northern entrance into Whakatū, Nelson. Whakatū Marae development in the 1960’s from an disused land to a beautiful site that houses the Whare Tupuna-Kaakati, a Wharekai-Mauriora, 6 Whare Kaumatua, Kopuawai Te Kohanga Reo, a Kokiri Centre that services Health and Social Services, an equipment shed and ablution block. In March 2013 Whakatū Marae signed a Memorandum of Understanding with TWONA. Whakatū Marae is currently using TWONA IMAP Online for their community support services, and is one of the most active provider. Provides services which empower people in our rohe with the skills, knowledge and conviction to lead and promote healthy living. They Aim for affordable, accessible and appropriate health services. Whakawhiti Ora Pai is one of the first providers to practice the Harakeke IMAP model alongside the IMAP Web Application. Training with Barbara Larsen of Whakawhiti Ora Pai was been successfully conducted last 19-20 November 2012. Provides free health services and promotes healthy lifestyles, with the ultimate goal of improving the health disparities of all people living in the Ngatiwai Rohe. The services offered are: mobile community health nurses, community health workers, kaupapa Maori medical support services, kaupapa Maori advanced nursing, Korikori a Iwi and the Community Action Youth and Drug service. November 2012, Ki a Ora Ngatiwai signed MOU and SLA with the TWONA and is now using TWONA IMAP Online with their community support services. The first Maori Health Provider service on the North Shore was established in 1995 at Awataha Marae under the management of the Marae committee. The practice was focussed on primary healthcare and consisted of a GP, a nurse, a community services worker and receptionist. By 1997 the community had become very involved in the development of the health provider, so an Incorporated Charitable Society was set up which gave the community control of the provider. The organisation was renamed Te Puna Hauora o te Raki Paewhenua and a board of 10 consisting of 5 staff and 5 community members was appointed, with the Chairperson always chosen from the community and having a casting vote. Most importantly, from a Kaupapa Maori perspective, a Kaumatua and Kuia advisory group was established to support the board and organisation. This has now evolved into kaumatua and kuia being both part of the board and part of the organisation. In 2000 the government enacted the New Zealand Public Health & Disability Act, changing the health funding and contracting environment from one Health Funding Authority to twenty one District Health Boards. In 2001 the Ministry of Health released the Primary Health Care Strategy (February 2001) and He Korowai Oranga: Maori Health Strategy Discussion Document (April 2001). 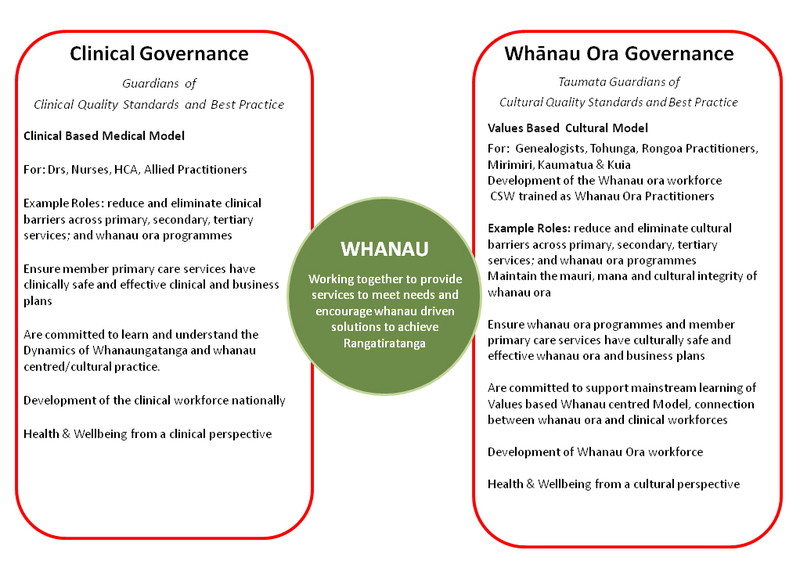 These documents formed the basis for Te Puna Hauora, in conjunction with Comprehensive Healthcare Services, an Independent Practitioners Association on the North Shore creating a Primary Health Organisation. This is named the North Harbour PHO Trust and was created on the 25th of June 2002. In May 2001 the organisation moved into new premises which consists of a large building donated by the Lady Allum Home on the North Shore. This was placed on land leased from the Awataha Marae, on the marae grounds. Funding was secured from both the Lotteries Commission and the ASB Trust to build a conference room, kitchen and carparks. Further funding was obtained from the Ministry of Education, ASB Trust, and Lotteries Commission to build an early childhood centre for 50 children on site. In December 2003, Te Puna Hauora achieved ISO 9001 accreditation. In October 2004 Te Puna Hauroa won the Ministry of Health Whanau Supreme Innovation Award for the Harakeke I-MAP model and was joint Supreme winner with Ngati Porou Hauora of Te Matarau Maori Health Provider Award. In 2004 approximately $2.3m of funding was received from the Ministry of Health, Waitemata District Health Board, Ministry of Education and Child, Youth and Family Services. In 2005 services were offered from 166 Birkdale Road, a building which was purchased by Te Puna Hauora to service the Birkdale and Beach haven whanau/client who prefer to access services closer to home. An early childhood centre for 50 children. In line with this development phase, a number of relationships with external agencies, service providers and individuals were developed to deliver services that were requested by the local community. Meningococcal trials and a broad range of other services and specialists. The concept is based on the Whanaungatanga Principles of sharing opportunities and resources. GM PHO is Clinical Director in designing and managing new concepts in the Primary Care Team in exchange for sharing the Human resources in the business arm including contracting, financial control, HR and Quality Assurance. All staff in the clinical arm are interviewed and chosen by GM PHO and employment pathway managed by GM Te Puna Hauora. All health mainstream contracting arrangements and funding streams are responsibilities of the GM PHO. The continued management including financial is the responsibility of the GM Te Puna Hauora. Te Puna PHO became a member of the National Maori PHO Coalition. TWONA joined with two other organisations (Hauora.Com and Te Oranganui Iwi Health Authority) in presenting their Briefing Paper to Associate Minister of Health TarianaTuria that proposed a strategic pathway for Whānau Ora Workforce Development. The paper was titled: ‘National Leadership Centre for Whānau Ora Workforce Development’. The proposal highlighted the transformative changes needed across the sectors that had to be intergenerational in their impact. New skill sets, new models of care, and new alliances and relationships needed to be forged to provide the strong and cohesive networks pivotal for success in delivering whānau ora services via a well-developed indigenous/and whānau workforce. The proposal aimed to provide Government with a viable and sustainable indigenous model of workforce development and deployment. Its scope was national; it had credibility and bridged both the regulated and non-regulated components of the workforce. The three organisations were participants in a national wānanga held early in 2012, which addressed many of the directions the briefing paper promoted. TWONA conveyed in an open letter to the Minister for Whānau Ora a vision regarding a structure and pathway for whānau ora nationally. The TWONA vision was to have Whānau Ora NA&WC’s that would be broadened to include comprehensive assessments across votes: health, social development, justice, and education sectors, etc. Subsequent concept development hui have been held with the MOH [specifically, the Sector Capabilities and Innovations Directorate]. These have helped shape the development of this business case and the future direction and role for TWONA. Included in this series of hui has been a combined one involving WDHB Senior Management in which it was agreed that WDHB would work with TWONA on setting up a pilot for Whanau Ora development along the lines proposed to the Minister. In parallel TWONA management attended a workforce partnership Summit in Wellington with Te Rau Matatini, J Tamehana from Whanganui, and contributions from each entity were identified: ;TWONA – offers provider, enabling and enhancement tools and Change Management; Te Rau Matatini – offers policy, research, training, and National Conference and Hui Facilitation; J Tamehana, Whanganui – offers indigenous curriculum, training and education at NZQA Level 6 equivalent. To further strengthen its multi sector reach TWONA has also been working with NZ Corrections to pilot the use of The Harakeke IMAP® for pre release prisoners. All this activity has positioned TWONA well to be an active and enabling partner in the further development of the full Whanau Ora proposal. TWONA sees a continuation of this alliance and partnership building as a strategic priority. 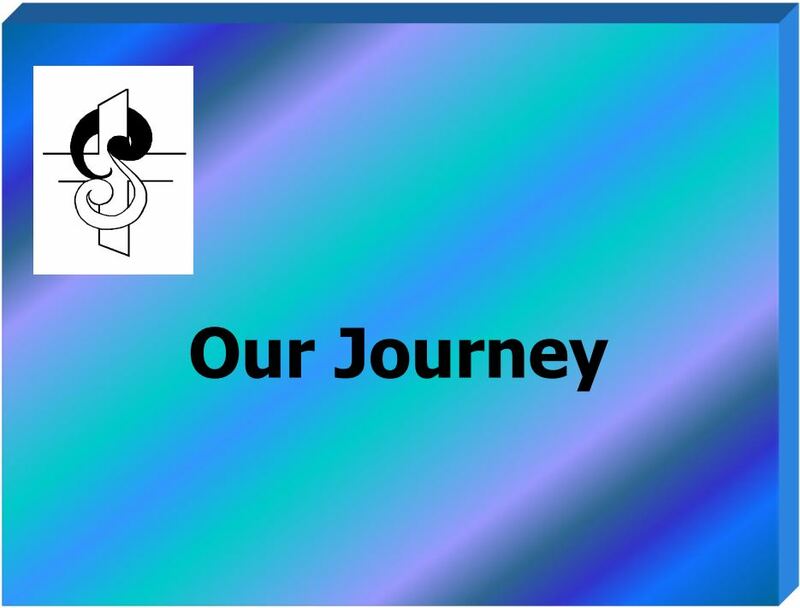 In April 2012 journey of development of IMAP® Values Based best practice model from paper-based to website completed Concentration on Values Based Alliance models with shared opportunities developed. November 2012 – Ki a Ora Ngatiwai signed MOU and SLA with the TWONA. March 2013 – Whakatū Marae signed a Memorandum of Understanding and a Contract for Software and Support Services with TWONA. April 2013 – Te Oranganui Iwi Health Authority signed a Memorandum of Understanding and a Contract for Software and Support Services with TWONA. 3 June 2013 – TWONA IMAP Online version 2 launched. July 2013 – Te Rūnanga o Te Rarawa signed a Contract for Software and Support Services with TWONA. 4 Oct 2013 – TWONA IMAP Online User Manual launched. An important component of the alliance will be the retention of the sovereignty of each organisation. The Parties share the key values of; Tika [shared vision and pathway]; Pono [integrity]; and Aroha [compassion] and these will be the foundations supporting the relationship. Te Puna is seeking a ‘post box’ type arrangement with ProCare .